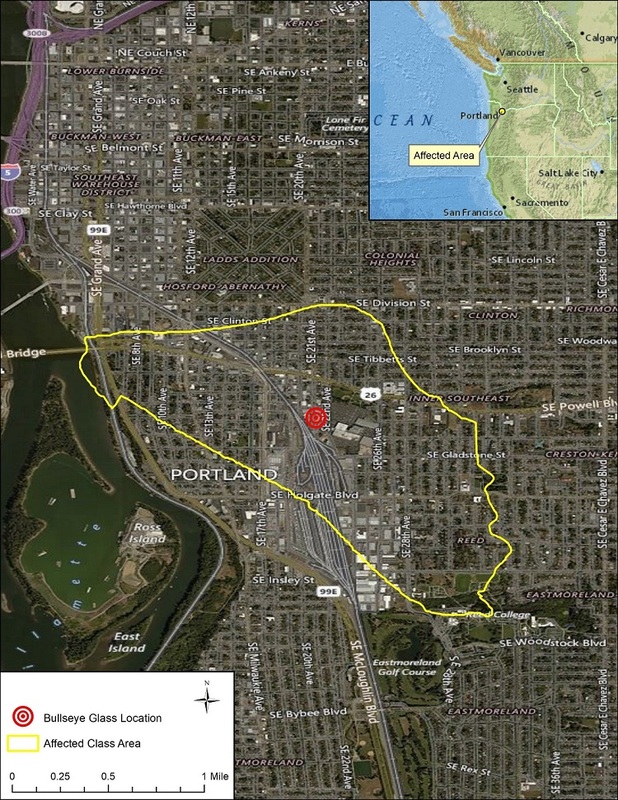 Public records show that on February 3, 2016, you may have owned or resided in a residential property in Southeast Portland alleged to have been affected by the emission and/or deposition of certain heavy metals generated by Bullseye. Those properties are the “Class Properties”. If you were an owner of or resident at one of those Class Properties on February 3, 2016, your rights are affected by this notice. For general reference, the map below depicts the area in which the Class Properties are located (the “Class Area”). If you are unsure whether a property is in the Class Area, a list of addresses of Class Properties is available HERE. You may also contact Class Counsel, the lawyers appointed to represent the Class, if you have any questions. Please see Question 25 for information on contacting Class Counsel. You are not a member of the Class if you were only a temporary guest on residential property in the Class Area on February 3, 2016, or if you otherwise lacked legal property rights to a residential property in the Class Area on February 3, 2016. Bullseye Class Action Settlement, Notice Administrator, c/o A.B. Data, Ltd., P. O. Box 173059, Milwaukee, WI 53217. This lawsuit is about whether certain heavy metals—including arsenic, cadmium, and chromium—allegedly emitted by the process of making colored art glass at Bullseye have been emitted, and/or deposited on, or interfered with the use and enjoyment of certain residential properties within Southeast Portland. Judge Stephen K. Bushong of the Multnomah County Circuit Court of Oregon is overseeing this class action. The lawsuit is known as Meeker et al. v. Bullseye Glass Co., No. 16CV07002. In a class action lawsuit, one or more people called “Class Representatives” or “Named Plaintiffs” (in this case Scott Meeker, Erin Meeker, Kelly Goodwin, Bruce Ely, Kristi Hauke, Elizabeth Borte, Rino Pasini, Christian Miner, Judy Sanseri, and Howard Banich) sue on behalf of other people who have similar claims. The people together are a “class” or “class members.” The people who sued and all the class members like them are called the Plaintiffs. The company they sued (in this case Bullseye Glass Co.) is called the Defendant. The Court decided that this lawsuit can be a class action because it meets the requirements of Oregon Rule of Civil Procedure 32, which governs class actions in Oregon state courts. A copy of the Court order certifying the Class, as well as related materials can be found HERE. 5. What does the lawsuit complain about? In the lawsuit, the Plaintiffs allege that certain heavy metals, including cadmium, arsenic, and chromium, allegedly emitted from Bullseye’s production have interfered with the use and enjoyment of property or have been emitted and/or deposited on their properties, or both, and have caused both physical damage and “stigma” damage to their properties. 6. How does Bullseye respond to the allegations? Bullseye denies that legally significant quantities of heavy metals from its colored art glassmaking process have been emitted and/or deposited on any property, and Bullseye alleges that soil testing of properties proves this point. 7. Has the Court decided who is right? The Court did not decide whether Bullseye or the Plaintiffs are correct. Instead, both sides have entered into this Class Action Settlement to resolve the Plaintiffs’ claims against Bullseye. 8. Am I a part of the class? Records show that you may have owned or resided in a residential property on February 3, 2016, that is within the boundary the court certified for this class action. If you owned or resided in a residential property within the Class Area on February 3, 2016, then you are a Class Member. Not included in the Class are Bullseye Glass Co. and any of its subsidiaries, affiliates, owners, offices, or employees; governmental entities; residences of Reed College; the judge to whom this case is assigned and that judge’s immediate family; and all persons who submit a timely and valid election to be excluded from the Class. 9. What if I’m not sure if I’m part of the Class? If you are unsure whether a property is in the Class Area, a list of addresses of Class Properties HERE. You may also contact Class Counsel if you have any questions. Please see Question 25 for information on contacting Class Counsel. 10. What does the settlement provide? The Settlement provides that Bullseye will maintain and continue to use approved filters on all its glass-making furnaces, at its own cost. All Class Members will benefit from this relief. In addition, Bullseye will pay $6.5 million into a Settlement Fund to fund an air monitoring program in the neighborhood, a variety of types of reimbursements to Class Members, cash payments to Class Members, and for Court-approved payments for administration of the Settlement, attorneys’ fees and expenses, and to the Named Plaintiffs as class representative awards (see Question 21 below). All Class Members will benefit from Bullseye’s use of approved filters and the air monitoring program, regardless of whether they submit a Claim Form. But to be eligible for a money award from the Settlement, Class Members must submit a Claim Form (see Question 13 below). 11. What is the neighborhood air monitoring program? After the Settlement has received final approval from the Court, and the deadline for all appeals has passed, an independent engineering firm will conduct an air monitoring plan that will likely include placing monitors at a minimum of two locations on the Bullseye facility property and four locations distributed throughout the Class Area. Results of monitoring for arsenic, cadmium, chromium, and diesel-related pollution will be posted on a publicly available website at least monthly. That monitoring will continue for at least two years. At the end of the air monitoring program, the air monitoring equipment will be donated to a local non-profit, academic, or institution working on air quality issues in the Portland area. 12. What payments can I get from the Settlement? After the costs are paid out of the Settlement Fund as explained above in Question 10 and the neighborhood air monitoring plan is funded, the remaining funds will be distributed to Class Members in three categories: (1) reimbursement for certain emissions-related testing or cleaning between February 3, 2016 and January 18, 2019; (2) reimbursement for certain emissions-related testing or cleaning after final approval of the Settlement and the exhaustion of all appeals; and (3) a residual cash distribution. The types of payments Class Members can receive are explained below. Instructions for how to fill out a Claim Form is in Question 13 below. a) Soil testing done on residential real property in the Class Area for cadmium, chromium, hexavalent chromium, and/or arsenic. The reimbursement for soil testing is capped at $500 per tax parcel number in the Class Area. b) Soil remediation done on properties in the Class Area. Remediation can include purchasing replacement soil. The reimbursement for soil remediation is capped at $5,000 per tax parcel number in the Class Area. Reimbursement for emissions-related expenses after the Settlement obtains final approval by the Court and the time period for any appeals has run. a) If no soil testing for cadmium, chromium, hexavalent chromium, and/or arsenic has been done on your property since February 3, 2016, and you would like to have soil testing done on your property for these metals, you can elect this option on your Claim Form. If you elect the “future soil testing” on your initial Claim Form, after the Settlement has become final, we will send you instructions, which will include information you need to be reimbursed for soil testing of your property. Such reimbursement will be conditioned upon the Class Member providing reasonable documentation of such expenditure, like receipts. Such testing will be capped at $500 per tax parcel number in the Class Area. b) Soil remediation of residential real properties in the Class Area as may be necessary based on soil testing described above to bring that soil to within Oregon Department of Environmental Quality health guidelines for chromium or cadmium, and/or within the Agency for Toxic Substances and Disease Registry (ATSDR) standards for arsenic or hexavalent chromium. If you elect the “future soil remediation” on your initial Claim Form, after the Settlement has become final, we will send you instructions on how to seek that remediation. Any reimbursement for soil remediation will also be conditioned upon you providing reasonable documentation of such expenditure, like receipts or bills. The reimbursement amount for such soil remediation is capped at $5,000 per tax parcel number in the Class Area. If you have questions about whether your testing results will qualify you to be reimbursed for soil remediation, please call Class Counsel. Please be aware that Bullseye will be notified if any soil tests exceed contamination limits, but Bullseye will not receive personal identifying information like a name or address. c) If no member of your Class Member Household has previously submitted a claim for reimbursement for an air purifier, your Class Member Household is entitled to reimbursement for the purchase of one or more air purifier unit(s) that you purchased after the date the Settlement becomes final and is no longer appealable. If you elect the “future air purifier” on your initial Claim Form, after the Settlement has become final, we will send you instructions on how to seek reimbursement for that expense. Reimbursement for air purifiers is be capped at $300 per eligible Class Member household. You should not incur any future expenses for soil testing, soil remediation, or air purifiers unless the Settlement becomes final and you are sent instructions on how to do so. If you incur those expenses without receiving those instructions, they will not be reimbursable through this Settlement. You may receive one or more solicitations from firms or persons offering to conduct testing on your property. That solicitation is not something that the court or the lawyers involved in the case have generated or approved. As already noted, you should not expect any reimbursement from the Settlement for post-January 18, 2019 soil testing unless the Settlement becomes final and you are sent instructions on how to do so. To be eligible to receive those shares, each Class Member—or subset of Class Members, to the extent those Class Members were residing together as a household on February 3, 2016—must submit a claim together as one “Claiming Class Member Household.” The Claim Form can be found by clicking HERE. Each Claiming Class Member Household’s share is determined by whether that household owned or resided in the Class Property, or both, and the number of people who resided in that property, as of February 3, 2016. The total number of shares allocated to each Claiming Class Member Household = 1 + (1/2 of the number of people living in the household) + 3, if the Claiming Class Member Household owned the Class Property. Under that allocation, a renter who lived alone in a Class Property would be entitled to 1.5 shares, while a Class Member who owned and lived in a home in which 4 people lived would be entitled to 6 shares. 13. How can I get a payment? To qualify for payment, you must timely submit a Claim Form, which can be found by clicking HERE. Read the instructions carefully. You must make a decision when filling out the Claim Form whether you want to elect to seek reimbursement for future soil testing, remediation, or air purifiers. Once you complete the Claim Form, include all the documents the form asks for, sign it, and mail it postmarked no later than April 6, 2019, to ­­­­­­­­­­­­ Bullseye Class Action Settlement, Settlement Administrator, c/o A.B. Data, Ltd., P.O. Box 173059, Milwaukee, WI 53217. If you want to conduct future soil testing, possible future soil remediation, or to purchase an air purifier after the Settlement has become final and the deadline for all appeals has passed, you must make that selection on the Claim Form. If you make this election, the Settlement Administrator will send you instructions for how to claim reimbursement once the Settlement has become final and the deadline for all appeals has passed. 14. When would I get my payment? The Court will hold a Fairness Hearing on May 10, 2019, to decide whether to approve the Settlement. After the Fairness Hearing, there could be appeals. It’s always uncertain whether these appeals can be resolved, and resolving them can take time, perhaps more than a year. Please be patient. If you have elected on your Claim Form to participate in future cleaning or testing, we will send you Claim Form Two after the Settlement has been made final and after the date for all appeals has run. If you receive a payment from the Settlement, you are responsible for any tax consequences of that payment. Neither the Parties nor Settlement Administrator are providing, or have obligation or expertise to provide, advice as to the tax consequences of any payments made under this Settlement Agreement. 15. Why would I ask to be excluded from the Class? If you already have a separate lawsuit against Bullseye based on alleged emissions from Bullseye’s operations and want to continue with it, or if you wish to pursue a claim against Bullseye with your own lawyer, you need to ask to be excluded from the Class Settlement. If you exclude yourself from the Class—which also means to remove yourself from the Class, and is sometimes called “opting out” of the Class—you won’t get any money from this Settlement. However, if you exclude yourself, you may retain the right to sue or continue to sue Bullseye independently. If you exclude yourself, you will not be legally bound by the Court’s judgments in this class action. If you start your own lawsuit against Bullseye after you exclude yourself, you’ll have to hire and potentially pay your own lawyer for that lawsuit, and you’ll have to prove your claims. If you do exclude yourself so you can start or continue your own lawsuit against Bullseye, you should talk to your own lawyer soon, because your claims may be subject to a statute of limitations. If you exclude yourself from the Class Settlement, you will not be eligible to receive any reimbursements or other monetary payment from the Class Settlement. 16. How do I ask to be excluded from the Class? You may obtain an Exclusion Request Form by clicking HERE. To be valid, the Exclusion Request Form must be filled out, signed, and postmarked no later than April 6, 2019. Exclusion Request Forms postmarked after this date may be rejected. If you do not wish to be excluded, do not complete an Exclusion Request Form. A term of the Settlement Agreement provides Bullseye the opportunity to declare the Settlement to be null and void at its election (sometimes referred to as a “blow-up” provision) if more than five percent of Class Members timely exclude themselves from the Settlement. 17. How do I tell the Court that I like or dislike the Settlement? If you’re a Class Member and you don’t exclude yourself, you can object to the Settlement if you don’t like any part of it. You can give reasons why you think the Court should not approve it. The Court will consider your views. To object, you must send a letter saying that you object to Meeker et al. v. Bullseye Glass Co., No. 16CV07002. You must include your printed name, address, telephone number, your signature, information or documentation establishing your status as a Class Member, and the reasons you object to the Settlement. You must include the specific reasons for each such objection, including any evidence and legal authority you wish to bring to the Court’s attention. You do not need to hire an attorney to submit an objection on your behalf, but if you choose to do so at your own expense, that attorney must (a) file a notice of appearance with the Court by no later than April 26, 2019; (b) file a sworn declaration attesting to their representation of the Class Member on whose behalf the objection is being filed; and (c) satisfy (on behalf of the Class Member) all substantive requirements for objection described in this Section. Any Class Member (or their authorized representative, including but not limited to their attorney) who wishes to appear in person at the Fairness Hearing must file a written notice of intent to do so with the Court no later than April 26, 2019. See Question 22 below for information on the Fairness Hearing. Unless the Court directs otherwise, any Class Member who fails to comply with the requirements for objecting will waive and forever forfeit the right to object to the Settlement, to appear and be heard on any such objection at the Fairness Hearing, and/or to appeal from the Court’s disposition of the Settlement. 18. What’s the difference between objecting and excluding myself? Objecting is simply telling the Court that you don’t like something about the Settlement. You can object only if you stay in the Class. Excluding yourself is telling the Court that you don’t want to be part of the Class. If you exclude yourself, you have no basis to object because the case no longer affects you..
19. Do I have a lawyer in this case? The Court has appointed Keller Rohrback L.L.P. and the Law Office of Karl G. Anuta, P.C. to represent you and the rest of the Class Members in the class action. Together the law firms are called “Class Counsel.” Their contact information is provided below (see “Getting More Information,” as described in Question 25). 20. Should I retain my own lawyer? You do not need to hire your own lawyer because Class Counsel is working on your behalf. But, if you want your own lawyer, you will have to pay that lawyer. For example, you can ask your own lawyer to appear in Court for you if you want someone other than Class Counsel to speak for you. 21. How will the lawyers be paid? Class Counsel has brought and litigated this case on a contingency basis, which means that Class Counsel has not been paid for any of its time spent on the litigation to date, and that Class Counsel has also forwarded all costs of litigation. At the final Fairness Hearing on May 10, 2019, Class Counsel will be seeking the Court’s final approval of the Settlement Agreement and asking the Court for an award of attorneys’ fees and expenses up to, but not to exceed $2.5 million. Class Counsel will also seek approval of a $7,500 payment to each of the Named Plaintiffs (limited to $10,000 per married or cohabiting couple) for their efforts in representing the Class. The Court will hold a Fairness Hearing on May 10, 2019, at 3 p.m. at the Multnomah County Circuit Court, 1021 SW Fourth Ave., Portland, Oregon 97204. At this hearing the Court will consider whether the Settlement Agreement and proposed settlement is a fair, reasonable, and adequate resolution of the lawsuit. If there are timely and properly submitted objections, the Court will consider them and any response Plaintiffs and Bullseye may have to those objections. The Court may listen to people who have asked to speak at the hearing. At or after the hearing, the Court will decide whether to approve the Settlement. The Court also will decide how much Class Counsel and Named Plaintiffs will be paid from the Settlement Fund, and will make an award for approved litigation, notice, and settlement administration costs. You do not have to attend the Fairness Hearing. Class Counsel will answer questions the Court may have. But, you are welcome to attend at your own expense. If you timely and properly sent an objection, you may attend the Fairness Hearing and talk about your objection, or you may have your own lawyer speak for you. However, you do not have to attend the Fairness Hearing even if you send an objection. As long as you timely and properly send a written objection, the Court will consider it even if you do not attend. 23. What happens if the Court does not approve the Settlement? If the Court ultimately does not approve the Settlement, or if the Court’s approval is reversed on appeal or the Settlement Agreement is terminated, then the Settlement will become null and void. If the Settlement becomes null and void, the case will proceed as though the Settlement Agreement was never entered into. By doing nothing you will stay in the Class and you will benefit from the injunctive relief provided in the Settlement, namely Bullseye’s promise to operate and maintain filters on its furnace smokestacks and a minimum two-year neighborhood air monitoring program. But you will not receive any cleaning or testing reimbursement or other monetary benefits from the Settlement. If you do nothing, you will not be able to sue, or continue to sue, Bullseye—as part of any other lawsuit—about certain legal claims because you will be legally bound by the Settlement Agreement. In the Settlement Agreement, you will give up your right to make certain legal claims against Bullseye. The claims you will give up include all claims that arise from, relate to, or are in connection with airborne emissions from the Bullseye facility. You can review a full copy of the Settlement Agreement, including a full description of the claims you will give up if you do nothing, HERE. If you wish to keep those claims you must exclude yourself from the Class. If you wish to further evaluate the Settlement Agreement’s release of claims in light of your personal circumstances, you should immediately consult a lawyers to discuss your situation. If you have general questions about the types of claims you will give up if you do nothing, you may contact Class Counsel as described below in Question 25. If you are a member of the Class and do not take action to exclude yourself, you will be legally bound by all of the Orders the Court issues and judgments the Court makes in this class action. 25. Are more details available? Click HERE to review documents that have been filed in this case. All current dates are available on this website, although dates may be subject to change with approval of the court. Court documents are also available for inspection at the Office of the Clerk of the Multnomah County Circuit Court, 1021 SW Fourth Ave., Portland, Oregon 97204 during normal business hours. Please do not contact the Judge, the Clerk of Court, Bullseye Glass Co., or their attorneys, with questions.